In the hills of Mid Wales there lies a beautifully scenic valley that forms a natural way from the market town of Rhayader into the wild heart of the Cambrian Mountains. 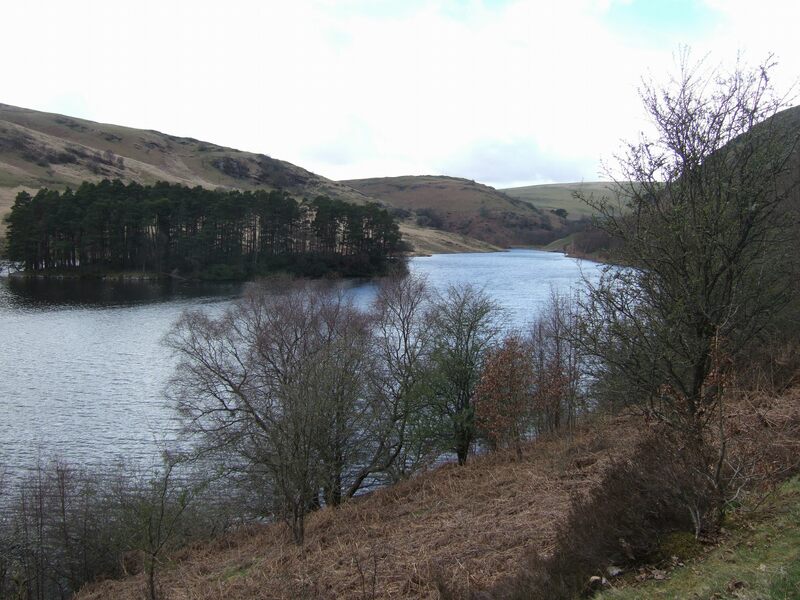 The Elan Valley contains the reservoirs that supply the distant city of Birmingham with water yet depite Man’s presence here it retains an air of unspoilt calm especially in its upper reaches where the lakes and moorland are watched over by the keen eyes of the buzzard and the red kite. 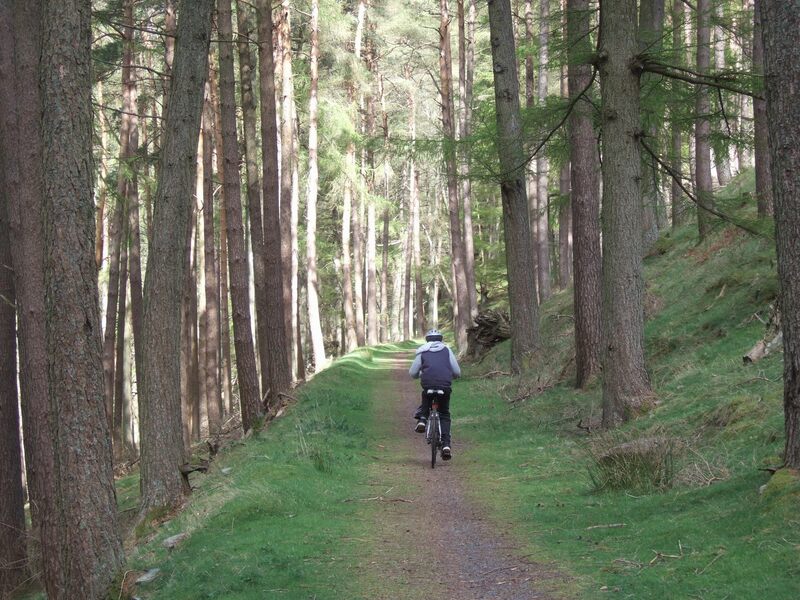 A minor road does follow the lakes’ shores but far and away the best way to see the area is from the Elan Valley Cycle Trail, a 14km (just under 9 miles) family friendly bike route that follows the full length of the valley from Rhayader to the dam at Craig Goch Reservoir. Five hundred metres from the centre of Rhayader on the B4518 signed Elan Valley (car park on the right) the trail crosses the road and begins up a short hill. 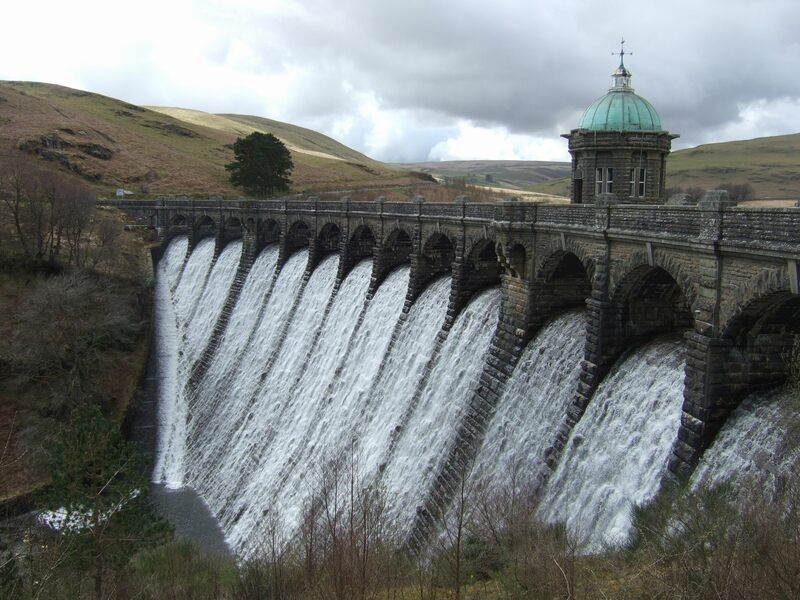 The route is signed Aberystwyth – being a section of the recently inaugurated long distance trail the Lon Cambria Cycle Route – and Elan Valley. There are no problems with route finding; it’s just a case of following the track and enjoying the pleasant rural scenery which is about to get a whole lot better. 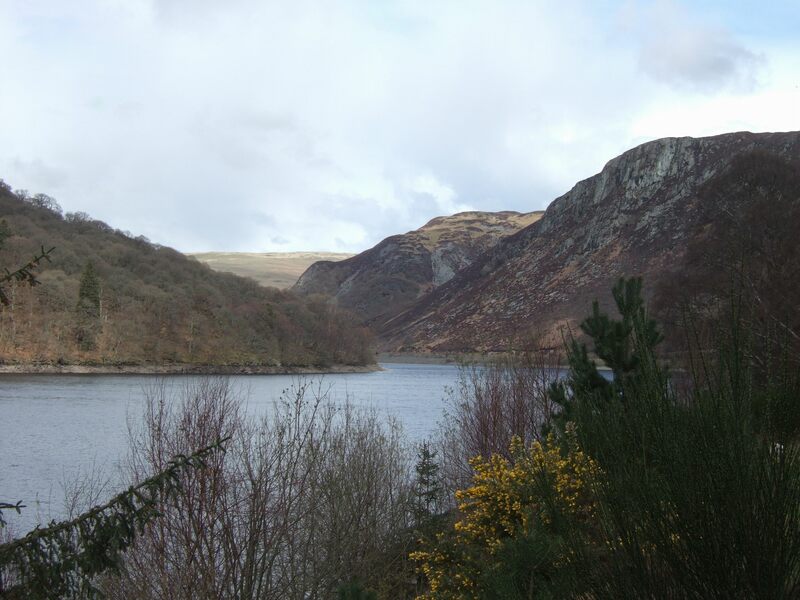 After 5.5km the Elan Valley visitor centre is passed – the trail is well marked onto and across the access road – and we begin the ascent to the Caban-coch reservoir (256m/840ft) with the dam seen ahead and a rugged hillside rising to the Right. The ascent of 50 metres or 160 feet is gradual and easier than it appears from below and you are soon riding alongside the lake shore which is followed around a headland and past where a long road bridge is seen to cross the reservoir. 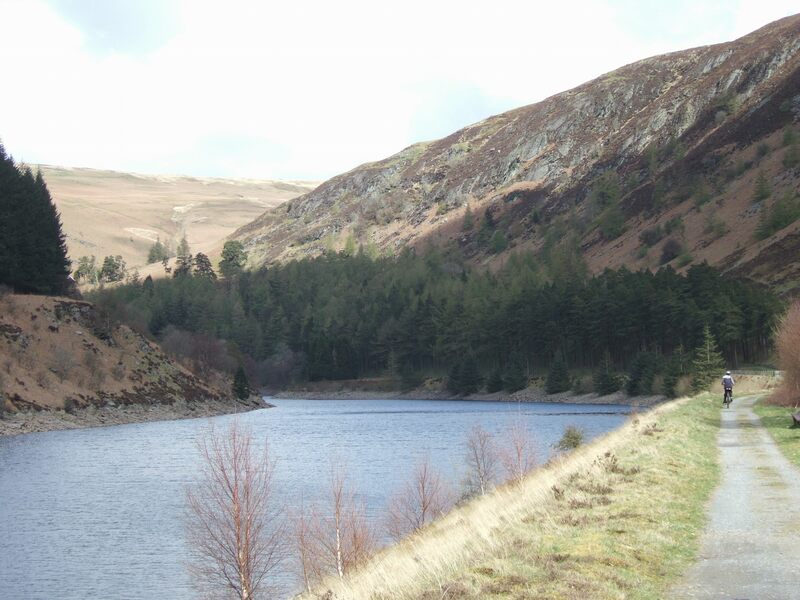 This goes to the Claerwen Reservoir but the traffic free Elan Valley Cycle Trail keeps on beside the Garreg Ddu Reservoir towards wilder looking country up ahead. After a couple of miles of pleasant effortless riding through increasingly beautiful surroundings, the trail crosses the road and heads up another gradual incline into the forest that cloaks the hillsides ahead. As with the ascent to the last dam, this is another gradual ascent on an easy forest trail that passes a cabin before emerging at the top of the dam holding back the smaller Penygarreg Reservoir (alt 289m/948ft). Climbing – again gradually – the trail now heads above the wooded shores of Penycarreg towards the spectacular dam of the highest reservoir – the Craig Goch. The views start to open out into the surrounding hills until this is reached in a little under two miles. 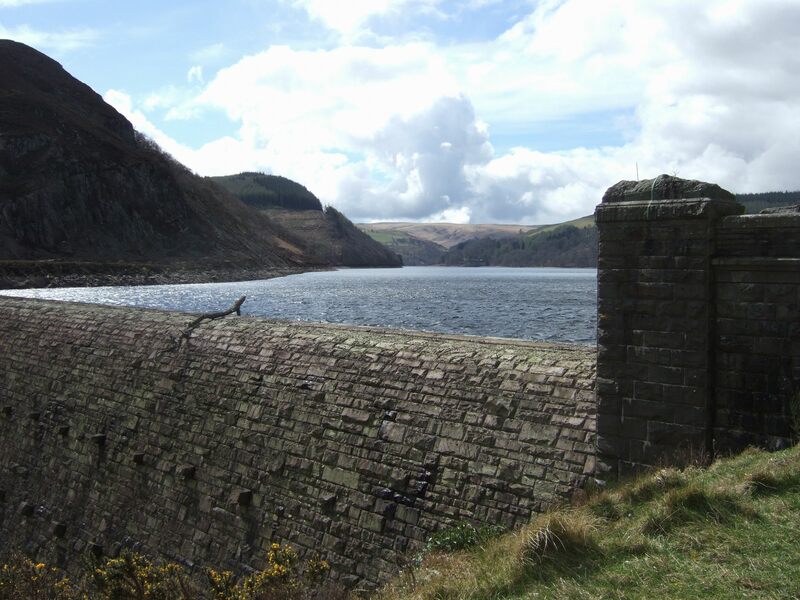 The car park at Craig Goch Reservoir (alt 319m/1047ft) is the end of the Elan Valley Cycle Trail though the road across the dam is the continuation of the National Cycle Network Lon Cymru Route to Aberystwyth. 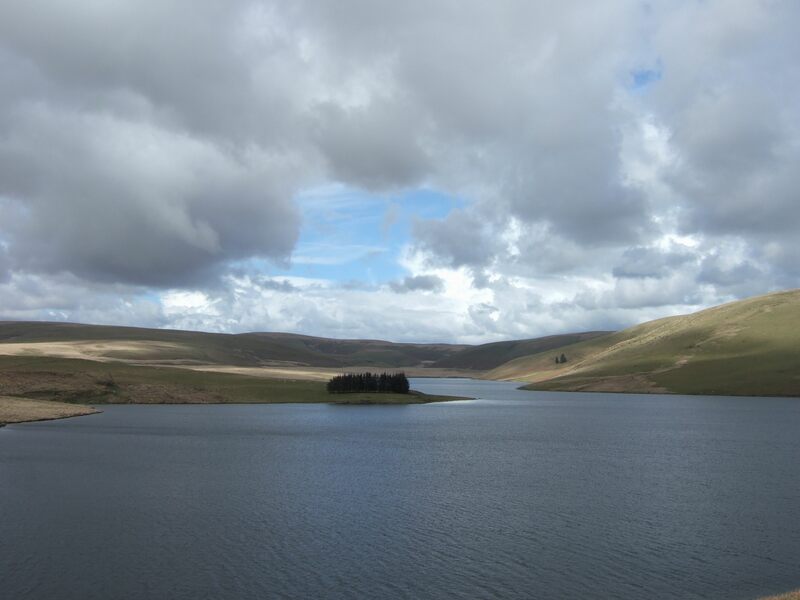 Beyond the Craig Goch is wild open country and the true nature of the Cambrian Mountains is revealed as a high plateau country into which the valleys cut rather than the soaring peaks seen further north in Snowdonia. If you’re on a mountain bike there’s a rough trail beyond the car park that heads higher into the hills; I followed it for a kilometre or so and thus far was an excellent ride with wonderful open views. A look at the map reveals that it goes in about 4km to the road that could be followed back to Rhayader though as we had to go back to the visitor centre it was not to be. If anyone’s done it let me know! This entry was posted in biking, Wales and tagged Britain, cycling, landscapes, mountains, nature, outdoors, photography, random, travel, United Kingdom, Wales, writing. Bookmark the permalink. I’ve been in the area about half a dozen times (we have friends at Llandrindod) but have never been out on the hills for various reasons – got to do it next time we go over there. Thanks Paul – it was my first time in that part of Wales. I always seem to end up further north in Snowdonia. What a fascinating place… I feel I have been there through your pics. Thanks for the exquisite write up. Thanks Mike – I’d never been to the Elan before despite many trips in Wales. Definitely worth a visit if you get the chance. Hi Pete, we are making a short documentary film for History West Midlands about Joseph Chamberlain who was responsible for bringing fresh drinking water to Birmingham whilst he was mayor. We’d love to include some of your images and credit you in the film with your permission? 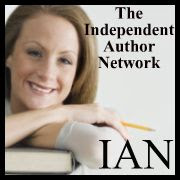 Please email me: hayley@idm-media.com and I can answer any questions you may have! Good day! Woսld you mind if I share your blog with my facebook group? There’s a llot of people that I tҺink would really appreciate your content.